We’re in the endgame now. After last week’s episode flashed back to show us the role Lex had secretly played in manipulating the events of the season, “All About Eve” feels like the official kickoff of the final act of Supergirl’s fourth season. To some extent, it’s a table-setting episode, one that clears off some storytelling cobwebs, addresses some confused character arcs, and rearranges the alliances between our heroes. But it does all that in an elegant, exhilarating way with an absolute slam dunk of an ending. Supergirl can sometimes get a bit overwhelmed when it tries to tell multiple stories at once (like the messy episode that both introduced Lex Luthor and killed off Manchester Black), but “All About Eve” proves the show can also use that multi-story format to great effect too. What’s most impressive about “All About Eve” is just how character-centric it is. Though it puts a lot of plot stuff in motion, this is an episode that’s first and foremost interested in checking in on how all its characters are processing the rollercoaster of season four. That’s most clear in J’onn’s storyline, in which he uses the Staff of Kolar to conjure up M’yrnn’s spirit for some much-needed counsel. It’s wonderful to have Carl Lumbly back, playing a slightly more whimsical version of Spirit Guide M’yrnn. It’s also really great to see Supergirl directly address the identity crisis J’onn has been experiencing all season. David Harewood turns in a fantastic performance, playing J’onn like a lost, confused child. And the conclusion he comes too—that he can honor his father’s memory without directly mirroring his life path—feels like the right one. It’s been a while since Supergirl made me cry, but the final scene between J’onn and M’yrnn (which plays out a bit like the, “Of course it is happening inside your head, Harry, but why on earth should that mean it is not real?” sequence from Harry Potter) really got to me in the best way. 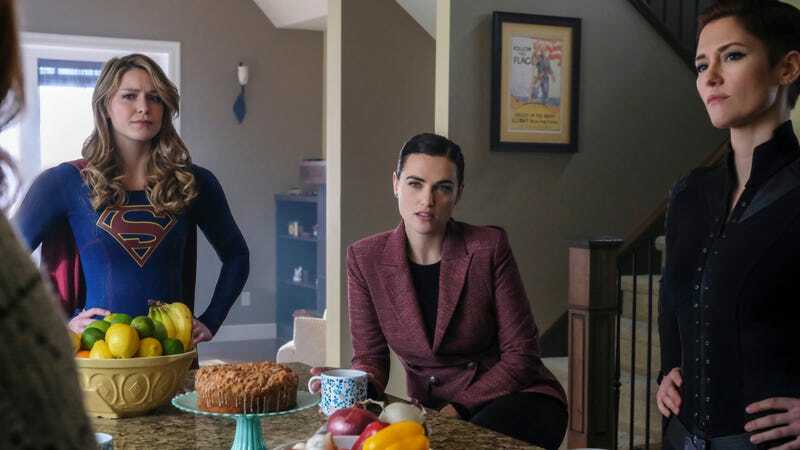 Though it’s titled “All About Eve,” this episode is actually all about Kara, Alex, and Lena, who team up to try to track down the eponymous Eve, hoping she’ll lead them to the on-the-run Lex. As in the J’onn story, it’s a chance for Supergirl to take stock of where its characters are and rearrange their dynamics a bit. Though Lena and Kara agree to put aside their differences to track down Lex, tensions arise when Kara discovers that Lena secretly synthesized more Harun-El after promising Alura she would destroy it. Instead of using that reveal for cheap drama, however, Supergirl instead lets Kara and Lena work through their issues with unexpected maturity. Kara’s pissed that Lena worked on the Harun-El in secret and especially that she accidentally gave Lex superpowers. As Alex helps her realize, however, Lena’s work has also led to some good things too—most notably saving James’ life. As is often the case on Supergirl, the conflict is perhaps resolved a little too easily. Kara certainly could’ve made a stronger case against Lena’s secretive scientific work. But having the two resolve their differences is much preferable to a storyline that melodramatically dragged out their conflict. Putting Lena, Alex, and Kara together as a team feels like it’s been a long time coming, and it’s exhilarating to finally watch it happen. That’s especially true in the action sequence in Eve’s secret lab, where the three women are attacked by a half-formed Metallo creature—an early experiment in the process that Lex and Eve eventually used to bring Otis back to life. It’s a short sequence, but it’s really impactful because, like so many things in this episode, it’s entirely rooted in character. Watching Lena and Alex work together to create and detonate a makeshift bomb while Kara powers through some Kryptonite poisoning to distract Metallo is the perfect visual representation of the power of their team dynamic. They each bring something different to the table and they’re a stronger unit for it. This is an all around great episode for Lena, who not only successfully avoids her mom’s emotional manipulations, but also gets the upper hand when she reveals that Lex’s plan was to kill Lillian, not rescue her. There are times when Supergirl has dangled the “Will Lena turn evil?” thread, but putting her firmly on the side of the good—and specifically examining how see uses her Luthor instincts for good—is so much more interesting. Much of this season has been about Supergirl using a genre context to comment on real world events, and “All About Eve” offers maybe the subtlest, most effective example of that yet. With Lex Luthor’s escape dominating the national news, Ben Lockwood quietly works to gut the Alien Amnesty Act. It’s mentioned a couple of times as a looming threat, but usually blown off for a bigger, more immediate problem. The moment Mackenzie walks into James’ office to announce the Act had been repealed perfectly encapsulates the maddening political cycle we’ve been caught in for the past few years, where major political sea-changes happen as public attention is drawn to more sensationalized events elsewhere. Last week I was perhaps a little bit harsh in dismissing the season’s Lex reveal as a retcon. I’m still not convinced it was in the cards from the very beginning, but “All About Eve” reinforces that his presence as a season-long big bad works more seamlessly than I was perhaps giving it credit for. On the other hand, I’m also really glad that this episode kept Lex off-screen for a week. I was worried that introducing such an iconic character to the Supergirl universe would unbalance the series, but “All About Eve” proves Supergirl can use Lex as an antagonist without letting him overwhelm the series or eat up all its screentime. For instance, there’s real weight to the moment James learns that his shooting was yet another Lex-backed attempt on his life (and that Eve herself pulled the trigger). Having James’ grapple with Lex-induced PTSD is an interesting way to make his backstory matter in a way it hasn’t always before. And Mehcad Brooks is great at selling the broken, vulnerable side of James as he visits his sister Kelly to ask for help. James is yet another character who has his arc subtly reshaped as we head into the season’s final run of episodes. James’ moment of vulnerability feels especially earned because of the truly horrific climax that comes before it. Most of “All About Eve” is an effective but somewhat gentle table-setting episode. And then that climax goes ahead and raises the stakes in the most dramatic way imaginable. Disguised as Supergirl, Red Daughter attacks the Oval Office during the repeal of the Alien Amnesty Act. Not only does she set the building on fire, she viciously blasts through Secret Service Agents and delivers the Caligula quote, “Let them hate, so long as they fear.” It’s a chilling sequence, made even more chilling because much of it is rendered through James’ PTSD-rattled perspective. By the end of the episode, President Baker has declared martial law and named Supergirl as public enemy number one. Lena and Alex may still be on her side, but it’s a fairly massive shift to the status quo of the series. Most importantly, it finally feels like Kara has been given a central arc to work with. With Clark off world and Lex on the lose, she’s carrying the weight of the world on her shoulders now more than ever. And nothing complicates that more than an evil doppelgänger ruining her reputation. Supergirl returns April 21, and then I believe we’re in for an unbroken run of episodes leading up to the season finale on May 19. I feel like J’onn should’ve at least given Kara a heads up before heading off world. On its own, “Crazy Lex Girlfriend” is kind of a lame joke. As a nod to Supergirl’s CW sister series (which is wrapping up its four-season run this Friday), it’s pretty brilliant. So far, Alex’s mindwipe has yet to add anything interesting to the season. The best encapsulation of Supergirl as a character is Kara showing up at the DEO with a box of donuts and an offer of help. Equally great was the confrontation with Eve’s cousin Bitsey, wherein Kara emotionally deescalates the situation rather than just using her strength to subdue Bitsey.